The series exploring the origins of common superstitions continues with ‘seven years of bad luck after breaking a mirror’. Bad luck or misfortune from breaking a mirror has a long history, and the ominous associations are pervasive around the world. But never fear, there are just as many remedies to restore your luck if you accidentally smash your looking glass. We’re all egotists at heart, our reflections have been fascinating us since the beginning of time. From 1st century Rome when steel and bronze mirrors were first introduced and we narcissists stepped away from admiring ourselves in pools of water, the mirror became a pathway to the gods. The myths associated with reflections as an embodiment of your soul or vital force moved from water to mirrors, with the new technology. Breaking a mirror broke the connection with the divine, tearing the soul from the body and leaving it adrift. In Roman times, a ‘mirror seer’ used water, and then mirrors, to divine the future, a practice known as catoptomancy. If the mirror broke during the divination session, this meant imminent death for the future-seeker. After fragile and valuable glass mirrors became commonplace, following their development in 15th century Venice, some argue that the broken mirror superstition perpetuated as a warning to careless servants. 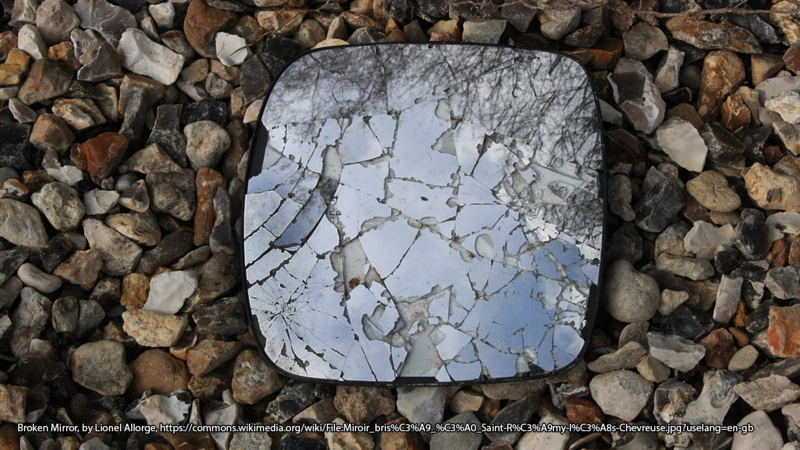 Bad luck from a broken mirror is a common superstition around the world. In Russia and Kazakhstan, breaking a mirror evicts evil spirits from their home. They will haunt the person who caused the damage as an act of revenge. In feng shui, a broken or bruised mirror distorts good energy and some say a broken hand glass foretells of the death of an infant. In Switzerland, the last person to look in a broken mirror is the first to die, but others claim your misfortune depends on how the mirror breaks: If it breaks into small pieces, your bad luck will be small, but be afraid if your mirror breaks into large pieces! And once the mirror is broken, looking at your reflection in the shards is bad luck in India and Russia. However, the time period of seven years of bad luck seems to come from the Romans. The Romans believed the body takes seven years to renew and similarly, palm readers in China believe that your destiny is renewed every seven years. Others claim the use of the number seven comes Christianity with a link to the seven days of God’s creation. Once you’ve broken the mirror, what can you do? You can say the Lord’s Prayer over the breakage, light white candles, or make the sign of the cross on a $5 bill. You can grind the broken pieces into dust so no reflections can be seen. You can bury the broken pieces on sacred ground and leave for seven years or if you need a quicker solution, early American slaves placed the broken pieces in a south running stream and the bad luck washed away in seven hours. Our continuing belief in bad luck from broken mirrors stretches all the way back to when we first glimpsed our reflection in a stream. But the seven years link comes from the Roman belief about our life force and was reinforced by the frailty of Renaissance mirrors. But never fear, if you have a south running stream close by, you can remove the bad luck pronto.